Many changes have taken place at Duquesne University and in the field of pharmacy since Robert McGivern graduated from Duquesne University School of Pharmacy in 1957. As he approaches the 60th anniversary of his graduation, McGivern recently took the time to reflect on his time at Duquesne and the long and fulfilling pharmacy career that followed. Today's student pharmacists may recognize the name Muldoon as a building on campus. But for McGivern, Hugh C. Muldoon, founding Dean of the School of Pharmacy, was someone who had a lasting impact on the person he would become. "I remember that Dean Muldoon held a Dean's Hour every morning before classes began. He was by far my favorite professor, and he probably shaped my character more than anybody else," said McGivern. Dean Muldoon passed away between McGivern's junior and senior year, and was succeeded by Dean John G. Adams. McGivern also has memories of the Holy Ghost Fathers (now known as the Spiritans) being a prominent presence on campus. In the rare moments when he wasn't working or studying, he enjoyed spending time with his classmates who lived in the wooden houses overlooking the Monongahela River. He kept in touch with several classmates, including Charles Winek, Bob Aber, Bill Slentz, and Stan Lefkowitz, with the group attending the School's annual Alumni Conference on significant anniversary years. One of McGivern's favorite Duquesne memories is of an honor that was bestowed upon him by his fellow student pharmacists at the end of his senior year. "There was a big party at the end of senior year, and some of the guys and girls put on a little stage play in the Administration building. They would give out awards like ‘Most Likely to Succeed,' or ‘Most Likely to Get Married.' They voted to give me the award of ‘Best Pharmacist.' I always thought that was fantastic, and I always appreciated the moniker of being Best Pharmacist," McGivern said. Throughout his years at Duquesne, and even before he entered the School of Pharmacy, McGivern worked at Terrace Pharmacy in the East Pittsburgh neighborhood of Bessemer Terrace. He speculated that his work at the pharmacy might have contributed to his Best Pharmacist honor. "I worked in a drug store all the time, so, for example, when we had a lab where we had to make glycerin suppositories, I would put them in a little glass jar. But a lot of the other students would put them in a cardboard box with a lid and, of course, the glycerin would melt and they'd get a bad grade. But I knew that they should be in glass because that's how we sold them at the store," he said. After graduation, he was drafted into the Army. After three months of basic training in Fort Knox, Kentucky, the Army sent McGivern back to Pittsburgh to function as a pharmacist at South Park Military Reservation. "Back then, there were missile sites surrounding most major cities, and Pittsburgh was one of them because of all the steel mills," he said. While serving in the Army, McGivern was free to work in retail pharmacy during his off hours, which he did at Blair's Pharmacy in Bridgeville. After being discharged, he worked at a pharmacy in Edgewood. It was while working there that he was recruited by Eli Lilly and transferred to Youngstown, Ohio, where he has lived ever since. He retired from Eli Lilly after 35 years, and then continued to work part time as a pharmacist at several independent pharmacies that are owned by his friends. McGivern and his wife of 58 years, Carolyn, have six children and eleven grandchildren. 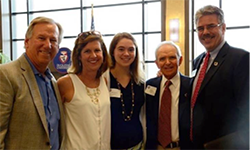 One of his grandchildren, Anna Marie Lovre, is currently a first year student in the Duquesne University Physician Assistant program.